You make an irrevocable gift to the public charity sponsoring your account of cash, securities, or other property. Your donor advised fund can grow dependent on the investment preference you establish with your account sponsor. You may propose that distributions from the fund be made on your own giving timetable, to areas of the American Cancer Society or other charitable organizations. You or family members you designate have advisory privileges over the fund and may recommend distributions to support specific areas of the American Cancer Society and other qualified charitable organizations. 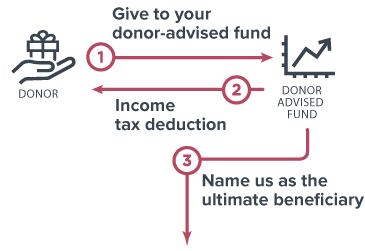 You may claim a federal charitable income tax deduction in each year you contribute to your donor advised fund. There is no capital gains tax due on appreciated assets, and the gifts may reduce your gross taxable estate. Gifts to a donor advised fund receive more favorable tax treatment than gifts to a private foundation. Unlike gifts made through private foundations, charitable distributions from a donor advised fund can be made anonymously. More detail on donor advised funds. Frequently asked questions on donor advised funds.